Hello, its me again. In the past few months, I started picking up Lucius as my new "main" master. Quotations because while he is the one I've been playing a lot casually there is still a lot I am learning. There are a lot of models that I think Lucius needs outside his crew box so I will most likely go over budget. Lets take a look at the main box first. Lucius Gustavius FitzWilliam Mattheson, Master, Living, Mimic, Dual Faction Guild/Neverborn. 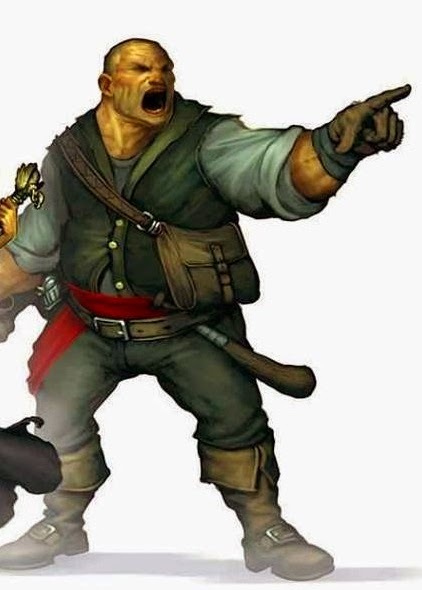 Scribe, Peon, Totem(Lucius), Living, Mimic, Dual Faction Guild/Neverborn. Captain Dashel, Henchman, Living, Guardsman. Guild Lawyer x 2 - Minion, Living, Mimic. Guild Guard x 2 - Minion, Living, Guardsman. Note: There was a misprint on the new Guild Guard cards, they are both have the Guardsman characteristic. 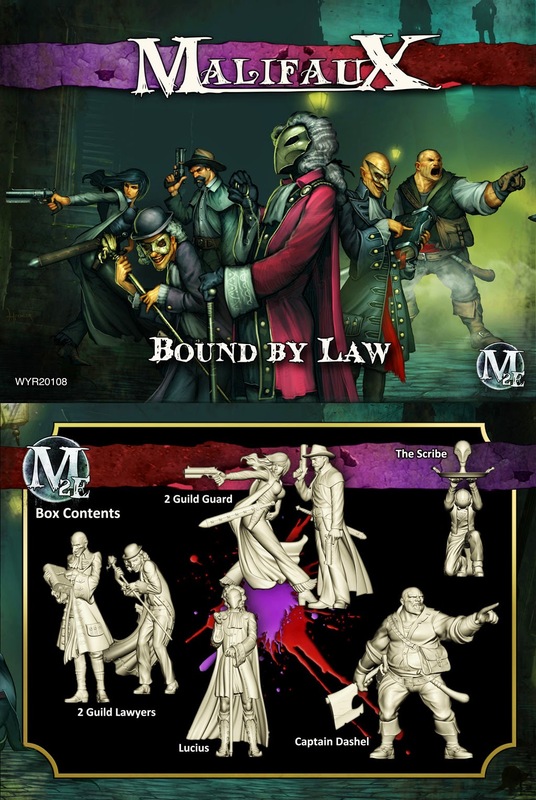 A master manipulator, there is not much in Malifaux that Lucius does not already know. Even less that he didn't help instigate. What can I say about Lucius, first off just looking at the statline he doesn't look to be much. He's got master level Willpower, a high defense, low wound count, and a pretty slow walk. His real power comes from his abilities and tactical actions. This is going to get wordy. Devil's Deal - This is pretty situational if you spend a soulstone you chose to deal 3 damage to a nearby friendly model to add one soulstone to your pool. Unless you have some models outside of the core set who can heal themselves or have high enough defenses that its not a huge lose to take wounds I would put it on the back burner for now. Note: This does not extended to soulstone use by other models, re-flipping initiative, and redrawing two cards. Highest Authority - This is the one ability that I would tattoo to the back of my hand. Negative flips against an opponent's attack are powerful, because they can't be cheated. If Assassination is on the table this will probably force your opponent to either burn a soulstone or use AP to focus in order to get back to a straight flip. Elite Training - Another situational ability, great if you like to push Lucius close to where the action is or if you want to keep a bodyguard around Lucius. Positive attack flips to a nearby friendly minion, need I say more? Commanding Presence - Unlike some support masters, Lucius has put so much fear into his men that when he walks he inspires them. A minion within 18" and LoS may take a horror duel TN 13 to perform a (1) Action. This is better than Lucius's Issue Command tactical action due to range and allows Lucius to get into better placement. Note: This is the only way Lucius can issue orders on Austringers. Sword Cane - Typically if Lucius is in melee you want to get him out. But this is great deterrent if you have a ram in hand and the target has yet to activate. Double ram trigger causes Red Tape which causes double negative on to attack flips by the target. Note: This is Lucius's only tactical action that affects models other than minions. Issue Command - 50% of my activation are taken up by this ability, it gives a minion non-austringer (1) action. Can only be used once per model a turn, so if you fail you can't use it again. On the downside short range, but it gets longer when targeting Mimics or Guardsmen which synergize really well with the rest of the crew. Guild Rifleman - Gains +1 Ram if it uses Focus. Get Down! - This gives Defensive +1. But only until that model's next activation. I recommend saving this for models that have already activated in the turn or a model that is in immediate danger. Downside is that these models are mostly Enforcers and Henchmen, but on the plus side you probably won't be taking too many of these models. On the Neverborn side you are looking at 8(10*) Guardsman models to choose from. *Beta rules only as of blog post. Rules not finalized. Secret Objectives - I only take this if I plan on dropping a lot of scheme markers. I then place Lucius in the middle of a bunch of misplaced markers to give him some insurance. Legalese - This is a must take. Every so often you have an enemy aura that detriments you models(such as decaying Aura). Secret Assets - This gives Lucius is only range attack, but it requires a Ram of greater than 6 and higher than your opponents defence flip. Useless Duplications - Really helps that its ability can force an opponent to have to randomly flip to see if they hit the right target. Its other ability is good if you have a mimic meatshield, such as Tannen, Graves, or even Candy. Seen from the shadows, but never remembered. A silent and reliable assistant. Not much to say. I never use totems, but he is really inexpensive for 2ss. The main reason you'll want him is to remove conditions off Lucius. The side benefit is that he can give other mimics +1 defense. This helps putting Lucius and Lawyers at Df 7. Sadly The Scribe has terrible defense and will probably be targeted first to get rid of the bonus. If you have to use him for defense boosts make sure that your opponent doesn't have line of sight to him. Typically I leave this guy in my bag, but I might start using him more often. Promoted beyond his station, even his men still lovingly refer to him as sarge. I keep this guy around just to give (0) action focus to Guild Rifleman and Warden models. His melee has both triggers already built in. Not the best model in melee, but he can give slow to an enemy. I have never used his tactical action to give reactivate, mostly because none of my minion models have hard to kill and are rarely left with low enough wounds for me to warrant using it. Typically I use him as a support model. Standard Guild militia. some say they have the shortest life expecting of those who work for the Governor. Sans the accountants. These guys are your standard Guild minion. I find two of their abilities to be really good; Patrol and Investigate. Patrol ups the defense of nearby Guild Guard models making these guys durable for their cost, Investigate allows them to be placed in base with nearby enemy scheme markers without wasting any AP. Typically I use these guys to hold down areas and as distraction pieces. Note - I really like the female Guard model pictured above, but I have lost her left hand twice. It wouldn't have been an issue, but I specifically bought a second box so she could have both hands. Two faced, backstabbing cutthroats who would indict their own mothers if it would help further their career. 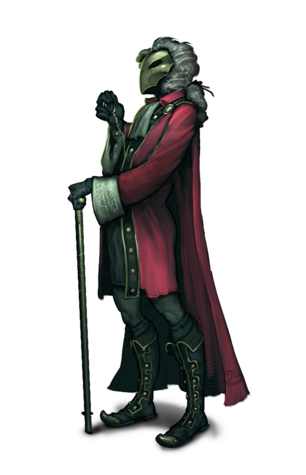 Like Lucius Guild Lawyers are Mimics and have Highest Authority, a good combo with their high defenses. While not the most imposing of a model, Lawyers bring a lot of conditions to spread around such as Slow, Paralyzed, Fees(Target takes 1 damage when they damage), and Poison. It also acts as a support model with the ability to give Hard to Wound and positive flips to horror duels to allies. Typically I use these guys for support. Note - The Lawyer Model with the hat and cane has a problem with the contact point where his fingers meet the palm of his hand. As such there might be need to finagle it to not break off. In my case I pinned his cane to his jacket. Guild Rifleman - Minion, Low Cost, High Damage. Synergize well with Lucius's Take Aim! 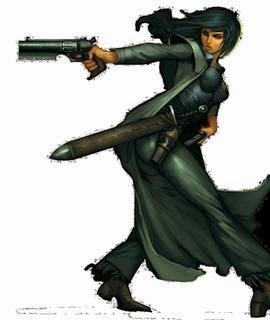 and Captain Dashel's Aim and Fire. Lucius's Issue Command range is increased for this model. Warden - Minion, Average Cost, Highly Durable, Range Paralyze Trigger. Lucius's Issue Command range is increased for this model. Guardian - Minion, High Cost, Highly Durable, Minor Healing and Support. Hunter - Minion, High Cost, High Damage, Range Slow Built-In, Scheme Runner. Death Marshal - Minion, Average Cost, Durable, Can Bury Enemy, Scheme Runner. Executioner - Enforcer, High Cost, Terrifying(Living), High Damage, Decapitate Trigger, Scheme Marker Removal. We'll see what I decide to go with at the end of February, I will be at TempleCon's Gaining Grounds tournament so I should be able to get a few games in there. If you have any questions or comments feel free to leave them down below in the comments section or you can find me on twitter at @DontEatRawHagis.